A lot of Samsung fans are still wondering what the next wearable will be called. Previous reports suggest it might be Gear S4, but from the latest leak of the device, It seems like Samsung’s next wearable will be named the Samsung Galaxy Watch. 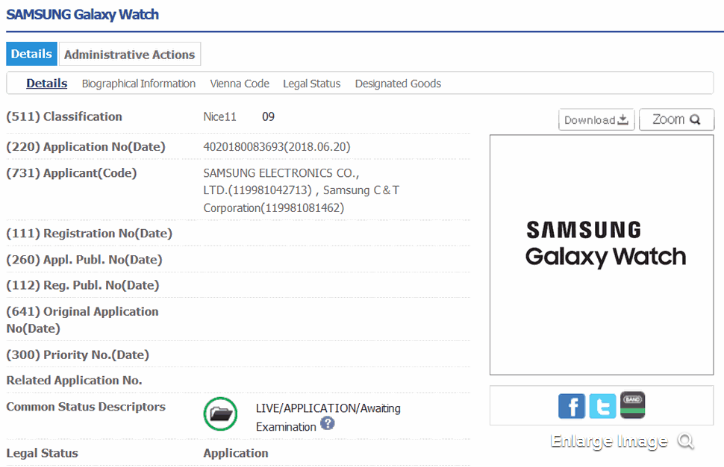 The leak shows that Samsung submitted a patent for the Samsung Galaxy Watch logo to the Korean Intellectual Property Office where the leak was revealed. Based on previous rumors concerning the Wearable, chances are Samsung might be planning on launching Two devices (the Galaxy Watch and the Gear S4), or probably they will be rebranding it’s “Gear S” watches with the Galaxy Watch name. Well, we don’t have to wait too long to confirm our suspicion as Samsung is expected to launch the product next month at the IFA 2018, and it’s likely that a new smartwatch will appear then and perhaps even a new fitness tracker and tablet, as the Samsung Gear Fit 3 and the Galaxy Tab S4 are also rumored.